METEF uses high quality materials, equipped with leading production including inner & outer ring super finishing machine, grinding machine, auto assembling line, ultrasonic washing machine, noise testing machine etc. to achieve a comprehensive manufacturing factory with integrated flow line and optimized structure. applied in machine, home appliance, motor etc. METEF supply complete solutions for plastic rollers which used in different application: furniture, sliding door & window, shower room ,elevator, conveyor roller system etc, Bearings are available by different manufacturing way: grinding, turning. 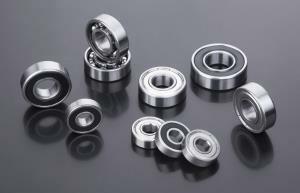 PA6, PA66, POM, PU(polyurethane) are widely used for bearing coating. According to strict loading and noise request, METEF can supply special plastic material to meet demand. Bearings are manufactured by carbon steel, chrome steel and stainless steel, with different surface finishing, for example: zinc coating, zinc-nickel coating etc. Bearings are available by full ball structure, double inner structure, spherical outer ring, outer ring V or U groove etc. Widely used in chain, trolley, crane system, mobile transportation system & factory automation etc. METEF ensure bearing performances noiselessly and smoothly, carry out bearing measurement inspection and life testing to guarantee bearings stability. bearings can be made of chrome steel or stainless steel, or with anti-corrosive surface treatments, manufactured by both way: automatic production line and manual working. Bearings can be supplied with other components, house holding, applied in various working condition, like garage door, sliding door & window, mobile wall, industrial door, greenhouse, conveyor system, crane system, shower room etc. Mostly we manufacture all kinds of plastic materials, alloy material, steel and die-cast material with suitable bearing according to the customer's drawing. I warmly congratulate the company website! The product sample download, which covers the latest product information.